Using a wedge in your pasta machine will allow you to control the size of your blends. If you make a lot of blends with clay, I’m sure there’s been at least one time or two when your blend has gotten too wide and isn’t long enough. If this happens to you, not to worry, you are not alone. Don’t worry, you are not the only one who needs some pasta machine help! There are lots of ways to get your blend resized without losing all your hard work. All you need to do is perform a basic search to find lots of hints, tips, and tricks. In fact, just this week, Cindy Lietz (the Polymer Clay Tutor) released her own video tip on how to reduce the size of your blend! You can watch the video at the end of this post. It’s a great tip and one you won’t want to miss. Making your own wedge could not be easier. All you need to do is gather up some scrap clay. You can make your blend you will use for this slightly streaked or blend all the clay together (which is what I chose to do). Then, roll your clay into a thick snake. Next place the clay in between the pasta machine‘s rollers (up against one edge). Now, gently “smoosh” the clay down onto the rollers. Using your fingers, make the top as even as possible. Next, gently remove the clay from your rollers. Place the wedge on it’s top on your work surface. Using your clay blade, trim the side that would face the middle of the pasta machine to make a straight edge. NOTE: DO NOT cut your clay while it’s in the pasta machine! It could easily scratch your rollers and you don’t want that to happen! Place on your baking tray, top down, and cover with foil. Bake in your polymer clay dedicated oven for 60 minutes at 270 degrees. The next time you are working with your clay and making a blend, use your wedge to help control the size of your blend! Simply place your wedge against the side of your pasta machine. 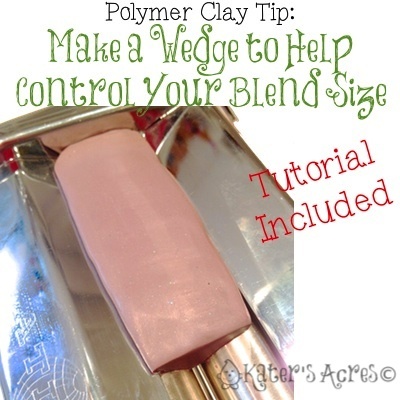 Roll your clay like normal, the wedge will help control the size. Remember, you can make your wedge any size you’d like. I have wedges in many different lengths to help change the size of my blend. Some I’ve had for years, others (like the monster 4″ wedge shown above) are brand new. This video is embedded from Cindy’s YouTube channel. Please go directly to her YouTube Channel to see LOTS more tips on polymer clay. Thanks Cindy! You are more than welcome. Enjoy! Thank you! This is a big help. I appreciate your guidance. No problem Donna – glad you found it useful! Than you I did have problems with my skinner blend being too wide so I will defo try this. Not a problem, I’m glad you found it useful. My skinner blends end up huge so this would be a wonderful tool for me. Except I’m very confused about the ‘trim the side’ instructions. Are you referring to the side that sits front to middle or middle to back? Trim it how, along the top edge, the bottom edge that sits on the rollers, or? And why does this need to be trimmed? Thanks for sharing your knowledge! I’m glad you like the idea Mary. “Trim the side” is referring to the edge that is between the rollers of your pasta machine. It must be trimmed to keep your sheet edge straight. Otherwise it might not be as straight as you desire. You are going to carefully trim from the front roller to the back, in a straight line. I hope this helps! Bake in your pasta machine for 60 minutes at 270 degrees. Yikes. My pasta machine only goes up to 250 degrees.